The significance of confrontations along the southern front during the Anglo-Boer War has inclined to be under-reported and hence strategically under-emphasised. This illustrated course undertakes to facilitate recollective justice to a ‘forgotten front’, particularly by means of the untold stories of the local people and common soldiers. The unmediated experiences of previously voiceless people during turmoil in a Karoo community are brought sharply into focus – though projected of necessity against the ravages and casualties of war. Because of battles elsewhere military chroniclers, even the usually punctilious British recorders, ignored or glossed over this phase and front of the war. The Anglo-Boer War, now more accurately referred to as the South African War, was neither “a gentleman’s war” or “a white man’s war” (references in earlier writings). In the region in question the descendants of the earliest inhabitants became equally embroiled in the conflict – as did brown and black South Africans. The role of women, too, was underacknowledged. Though enmity and depredation often prevailed, these lectures bring to the fore the human and humane, and even the humorous side of the adversaries. De Jongh, M. and Gordon, B. 2018. The Forgotten Front - untold stories of the Anglo-Boer War in the Karoo. The Watermark Press. Doyle, A.C. 1999. The Great Boer War. Galago. Grobler, J.E.H. 2004. The War Reporter. Cape Town: Jonathan Ball. Lunderstedt, S. 2006. Black involvement in the Northern Cape during the SA War 1899-1902. The Sol Plaatje Educational Trust. 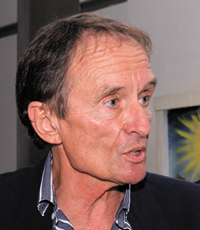 Michael de Jongh is Professor Emeritus and Research Fellow in the Department of Anthropology and Archaeology at the University of South Africa. He has published widely, and presented scientific papers nationally and internationally in the fields of ethnicity, urbanisation, traditional leadership, land rights, minorities, and human mobility. More recently he has researched extensively the “forgotten” first people of South Africa. His book Roots and Routes: The Karretjie People of the Great Karoo was listed for the Alan Paton Prize for Non-fiction and was awarded the Hiddingh-Currie Literary Award for academic excellence and service to society. His previous book is A Forgotten First People – the Southern Cape Hessequa (2016), and the most recent one, The Forgotten Front – untold stories of the Anglo-Boer War in the Karoo (2018) (with B. Gordon). Mike currently functions from Plettenberg Bay in the Western Cape and values living at the coast, while also finding time for mountain biking and a little golf.